This entry was posted in Anatomy, Drugs, Nephro and tagged pathology, pharmacology by Ali. Bookmark the permalink. Hi there – awesome site! I was hoping to use your determinants of GFR sketch for a talk I’m giving next week on kidney toxicity. Would it be possible to get a copy of the figure without the sketchymedicine.com watermark in the background? Perhaps at the side/bottom? Thanks and cheers! Wow, this is really wonderful. Thank you so much for sharing this, it makes science so much more easier to understand! 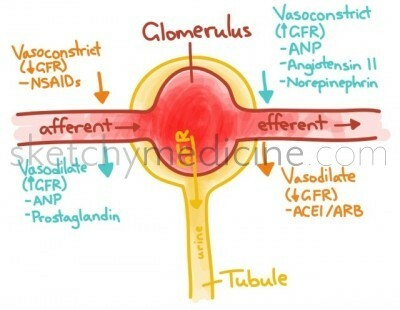 I am pretty sure Norepinephrine actually decreases GFR just because its vasoconstrictive action affects the afferent more than the efferent arteriole. So while it does constrict the efferent arteriole which would lead to increased GFR, it constricts the afferent MORE which leads to both low GFR and low RPF. Thoughts?? ?